Generate, and print 2D barcode symbologies. The programe generates and prints most popular 2d barcode symbologies including aztec code, aztec runes, data matrix (ecc 0-140, ecc 200), qr code, pdf417, micro qr code, micropdf417, maxicode, code 16k, rss family (rss-14 standard, rss-14 truncated, rss-14 stacked, rss-14 stacked omnidirectional, rss limited, rss expanded, rss expanded stacked), etc. 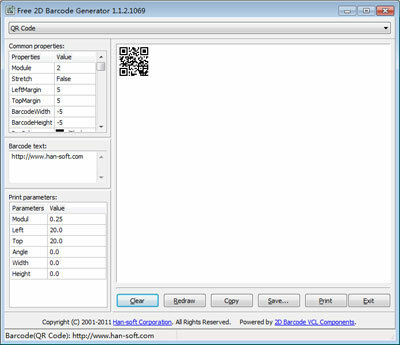 Free 2D Barcode Generator is an utility that works under windows xp, windows vista and windows 7. It supports both 32-bit & 64-bit windows editions, therefore it could run faster on 64-bit computers. It is Free so you can download it and share it with your friends. Estimated download time for Free 2D Barcode Generator on a common adsl connection is less than a minute. Version 10.0.2.2536 is brand new and was released twenty two days ago by Han-soft Corporation. Click the green download button to download it now.